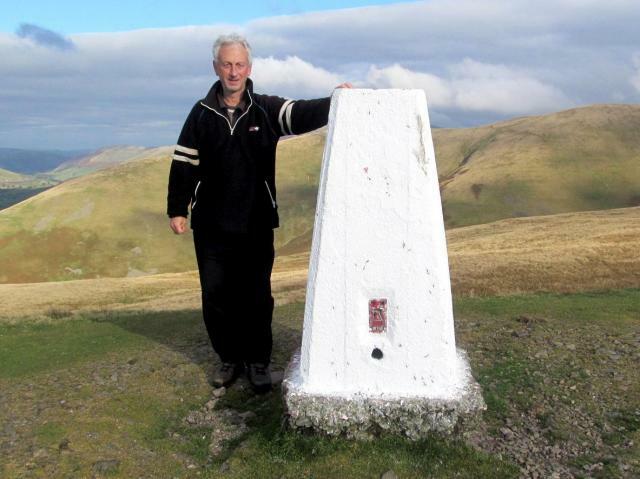 There are 85 photos for this trigpoint (view album). 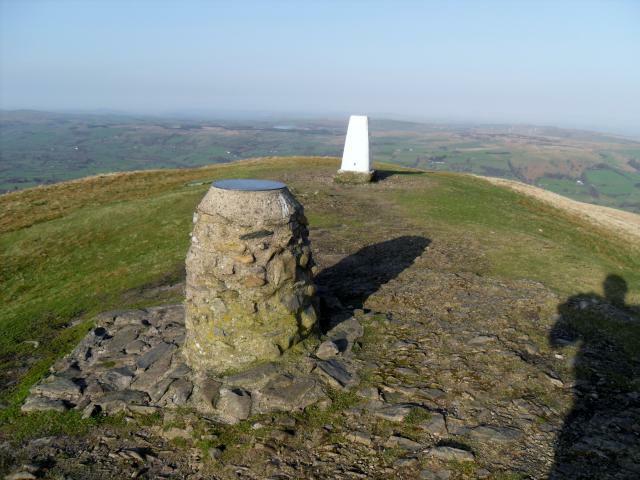 Is ranked joint 914th with 37 other trigs (more). See 77 more in the album. 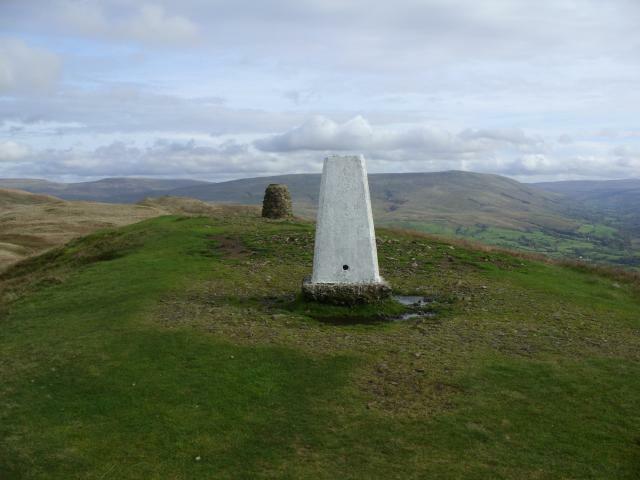 Last hill on a round of 8 in the Howgills today. Came down from The Calf, then dropped down to the road. 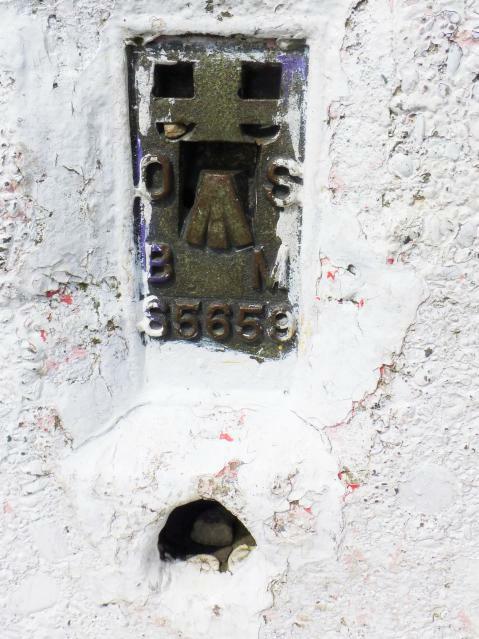 Pillar is careworn with a very chipped top and multiple coats of paint, carelessly applied. It's white today, but past coats have been green and red. Centre cap missing, no plug; all sight holes open. Ground erosion has exposed the foundations. 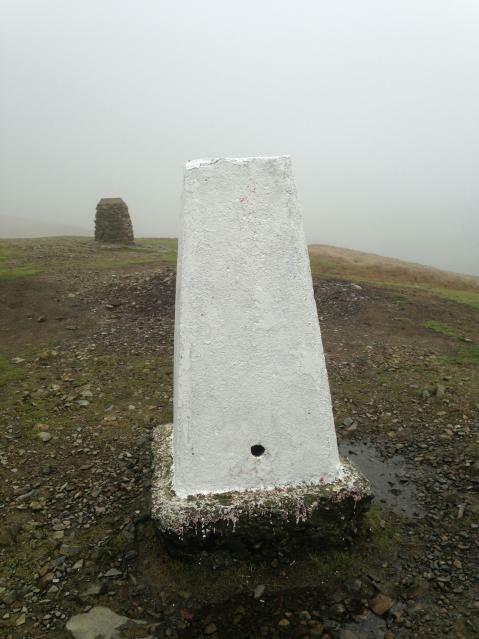 Cloud down so no views today. 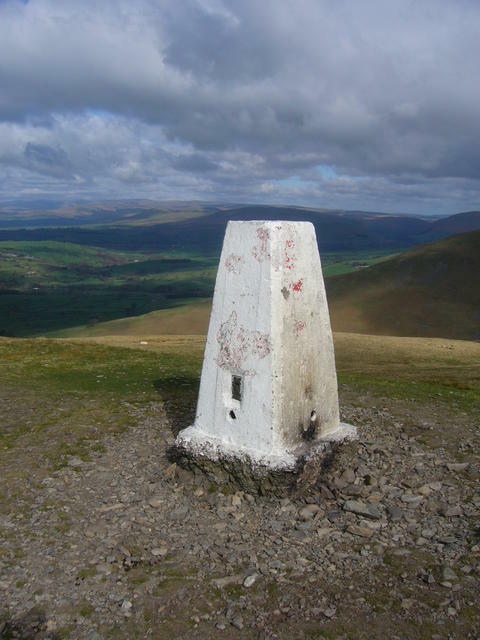 Approach from Sedbergh. Quite a lot of ground erosion - open spider. Nice setting - good views. 5659 is prime! 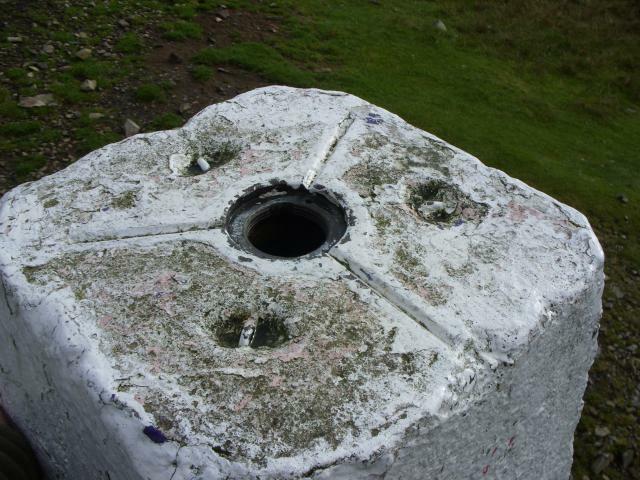 Walked over from The Calf on 4 Trig day out with P61,yet again fantastic walk great views. 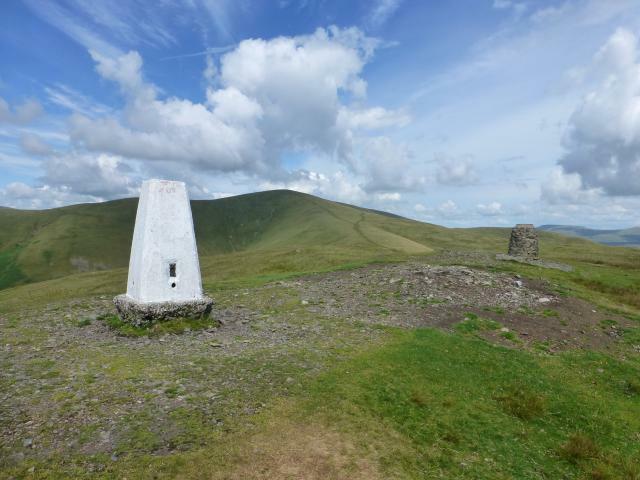 Revisit walked down over calders and arant haw trig still in vgc great views here topo as well went down the very steep fellside direct to Sedbergh. From the W on good path. In the mist so no views today. 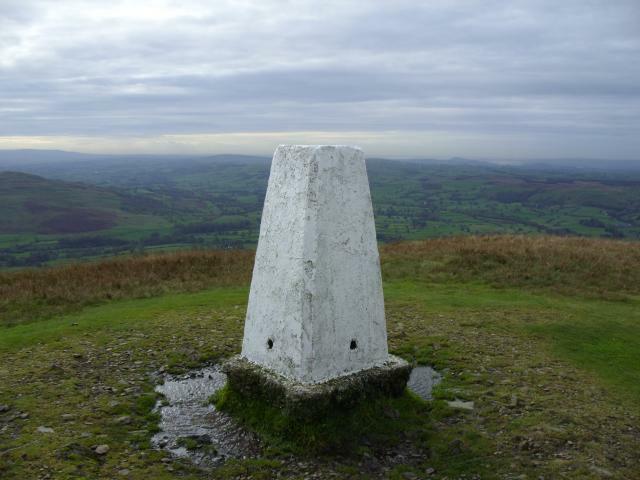 Easy spot but non existent views today! Day 2 of 12 Dent to Boot Walk. 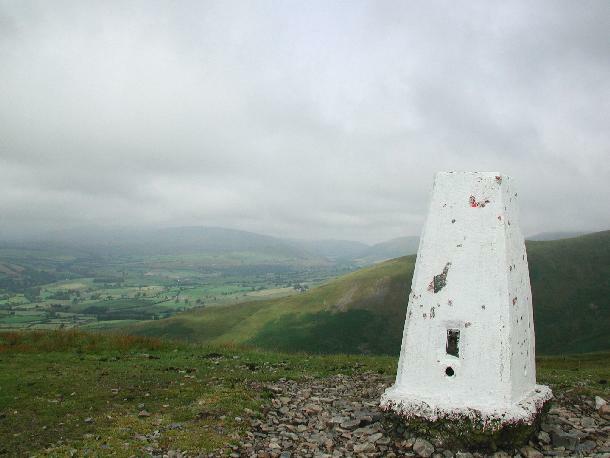 All my life I have been wanting to walk in the Howgills, being denied on last year's hike by the weather. 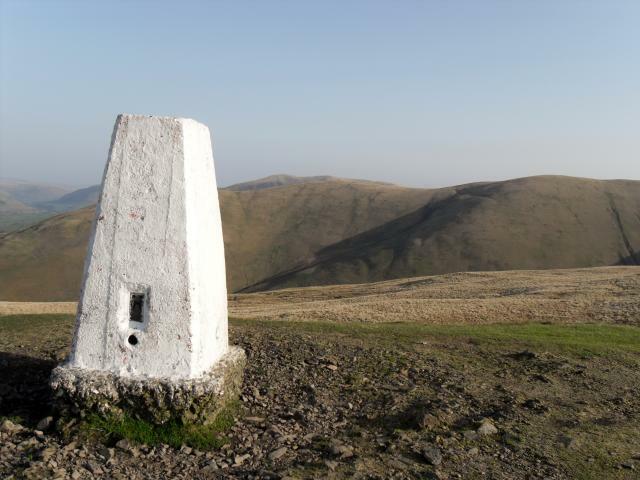 I have to say these sleek Silurian fells were worth the wait. 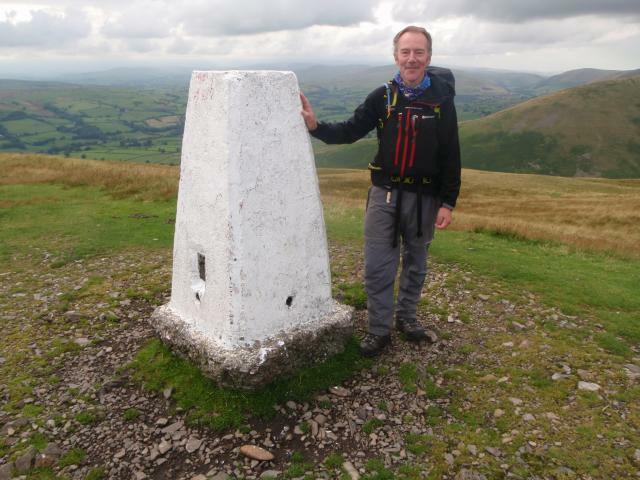 Today's route was a full crossing S to N from Holme Open Farm SW of Sedbergh to Ravenstonedale. 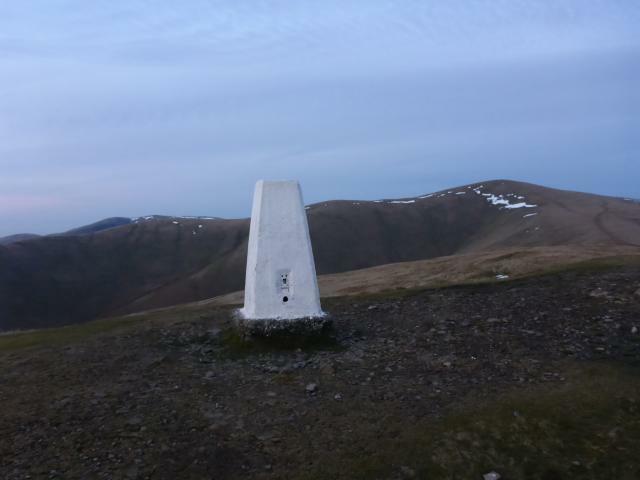 Decided to approach from the W from Howgill Lane. 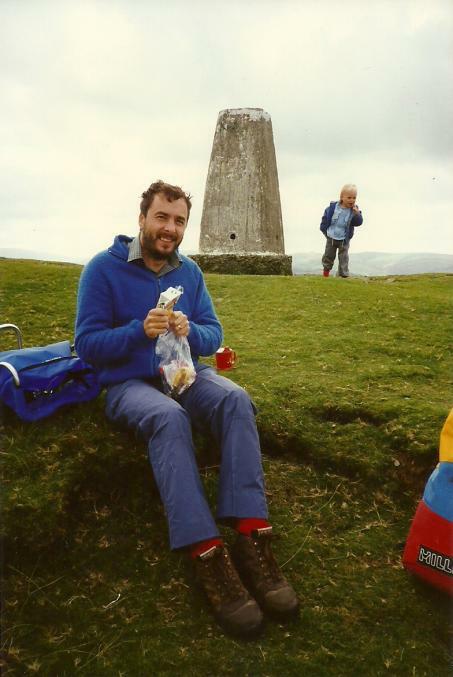 Quite busy at the trig itself, some German tourists admiring the view. 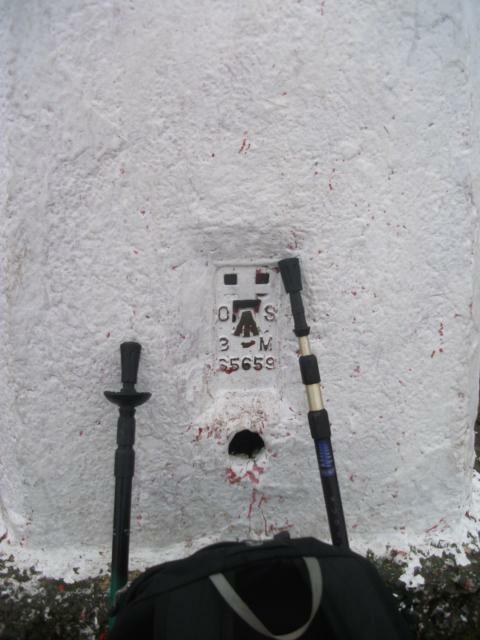 Good condition, some of the red still smeared on the pillar. 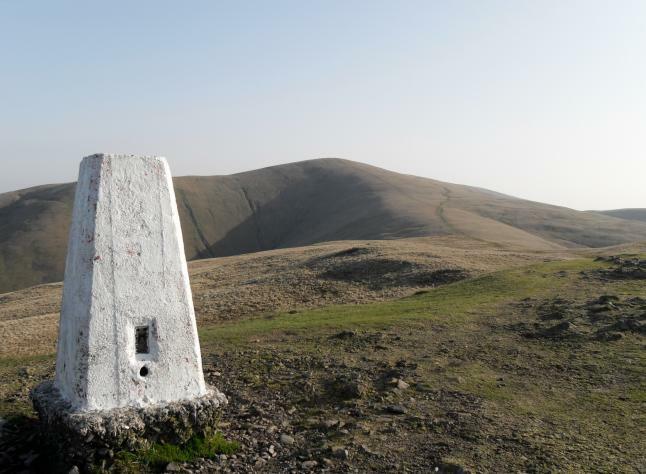 At last Winder is bagged, next stop the Calf itself, summit of all the Howgills. Red and White paint. Optional horses: all colours ! From Sedbergh, on to The Calf. 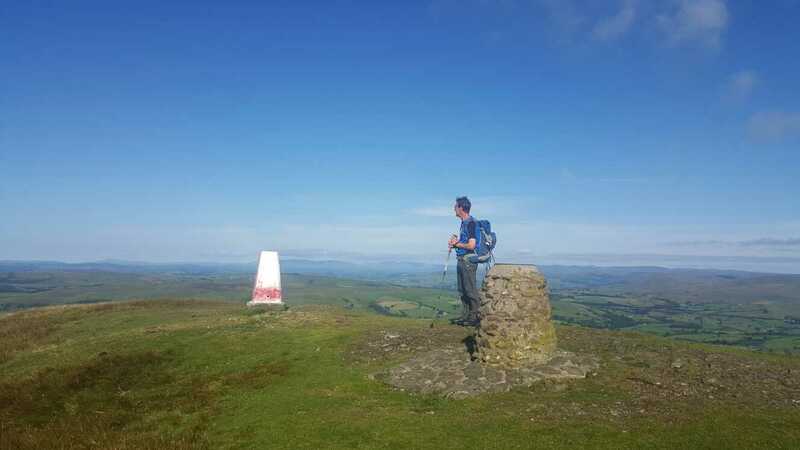 Excellent day, also caching including Prankster's Peak! First hill on a round of 7. 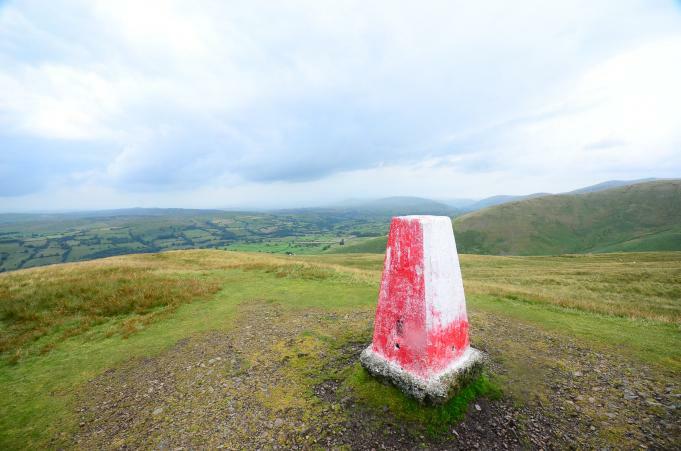 Up from the West on bridleway from small layby at Heights of Winder. Cracking viewpoint. Second visit. For photographs and GPS reading. Pillar freshly repainted white. Spider centre open, stones blocking centre hole. 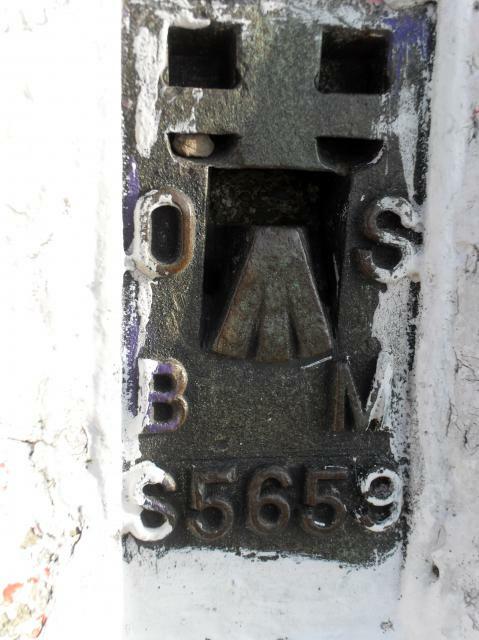 Flush bracket faces south, ~179�. All four sight holes open, innards filled with debris. Full 360� panoramic view. More blurb to follow. Someone has attempted to paint it red. 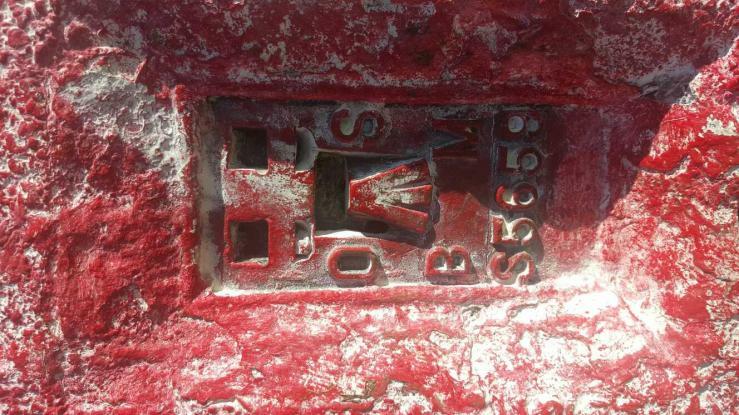 Had a splash of red paint over it- maybe raddle, the stuff they use for marking ewes that have been 'done' ? Very windy and freezing cold,great now spring has arrived. 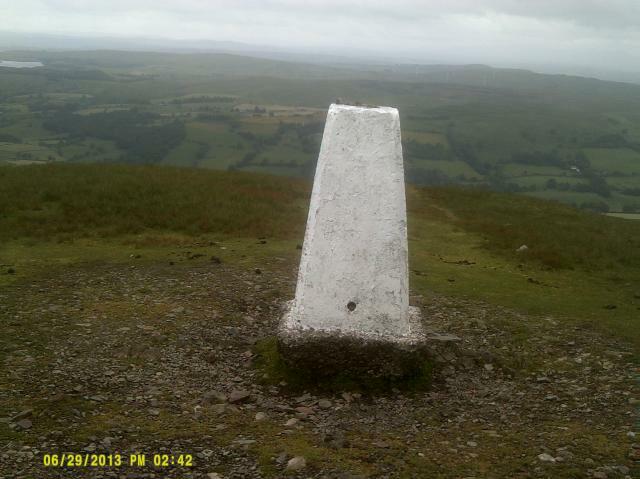 From Lockbank Farm headed straight up the steep slope to the trig. 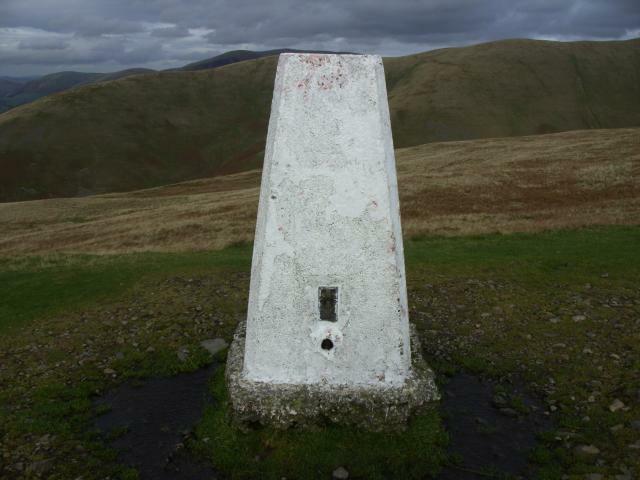 Parked in layby at start of PROW to West of pillar on Howgill Lane.White pillar in good nick,no cap/plug,all sight holes open,centre bolt not visible due to debris.Excellent 360� views. Final part of our journey, having started in Nebiggin-on-Lune at lunchtime. This pillar looks as though it's been green, pink and red at various times in the past. White and shiny now though. It looks to be bigger than most but maybe that's just because the ground has eroded around it. Am I shrinking or is this an unusually large pillar? 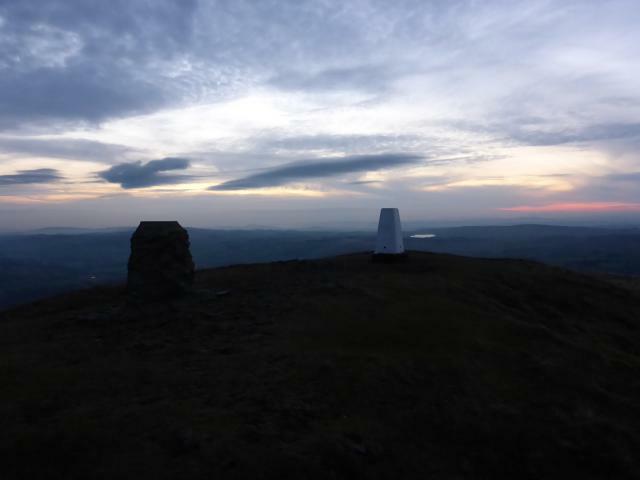 Trig and indicator at summit. Winder Hill The TP and indicator. Parked in lay-by on Howgill Lane. 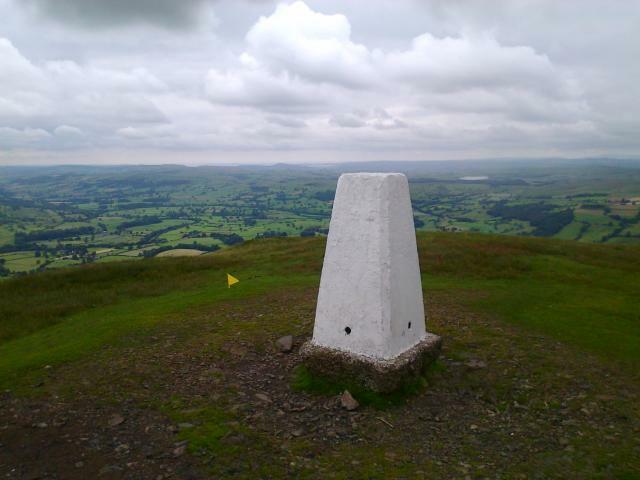 From there, I went past the farms and up onto the moor. 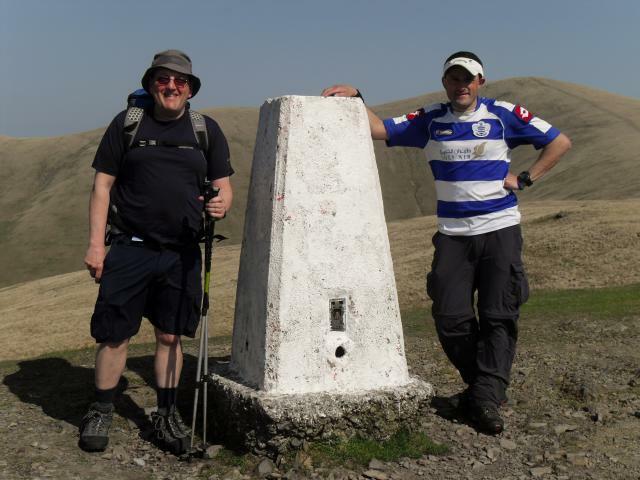 It was then a very very steep climb to the top. Slightly limited views because of the flat top, but still quite impressive. 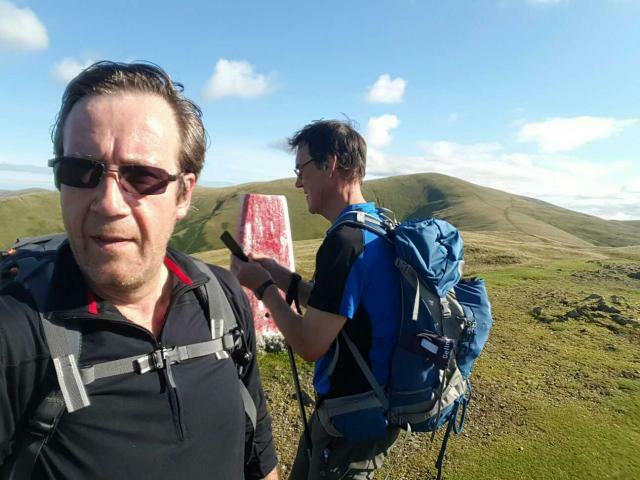 En route to The Calf and Cautley Spout on a 14.1 mile hike. 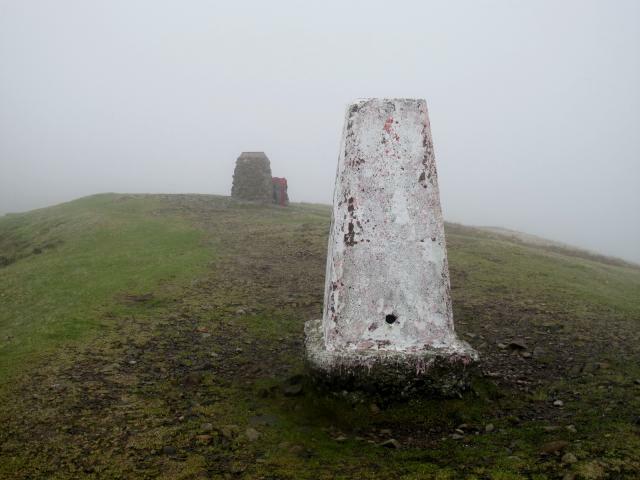 Both trigs shrouded in mist as with my last visit 5 years ago! 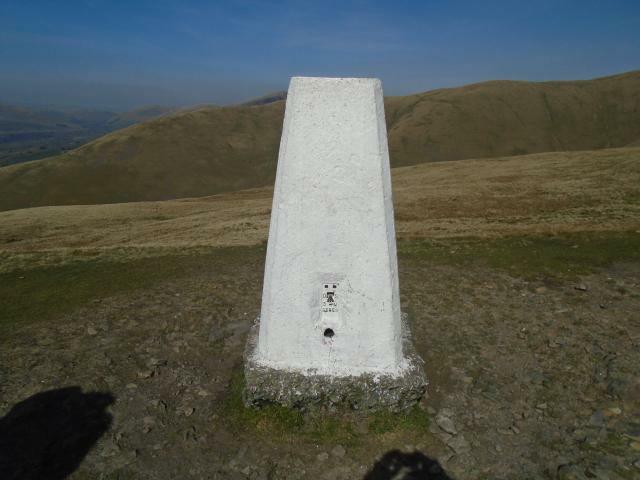 Hiked up to this one from Sedbergh after getting the shuttle bus from Dent station at Cowgill. 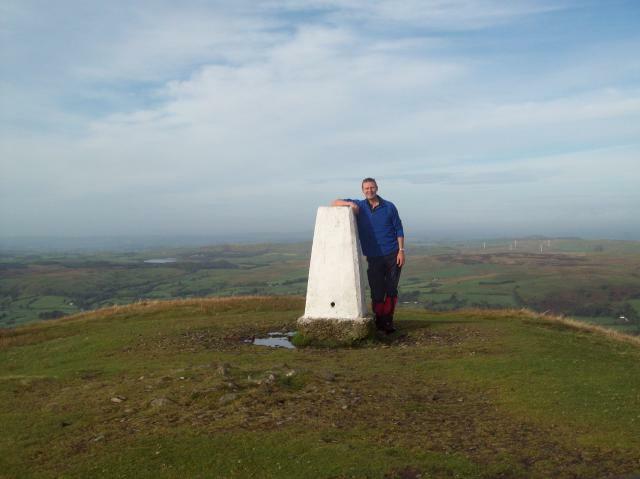 Went onto bag the Trig at The Calf in a 11.5 mile circular walk. Great weather clear, but very cold! 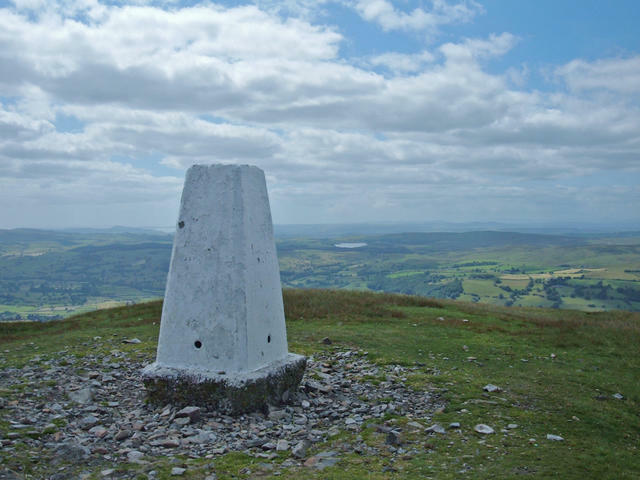 Great views towards a snow capped Wild Boar Fell, Swarth Fell and Baugh Fell to the east, with a winter wonderland look to the Lake District to the west. A truly great day out. 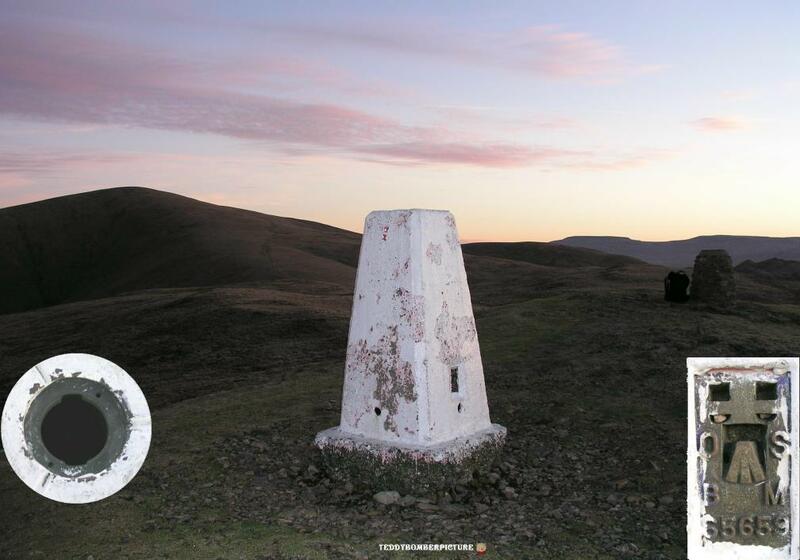 You can follow a detailed walking route and write up of this walk by typing Fell Finder into Google, thanks! 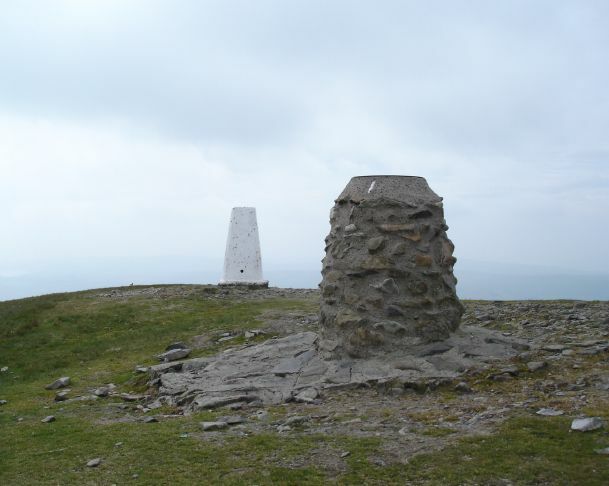 The Trig and Toposcope on Winder summit @ 473 metres. 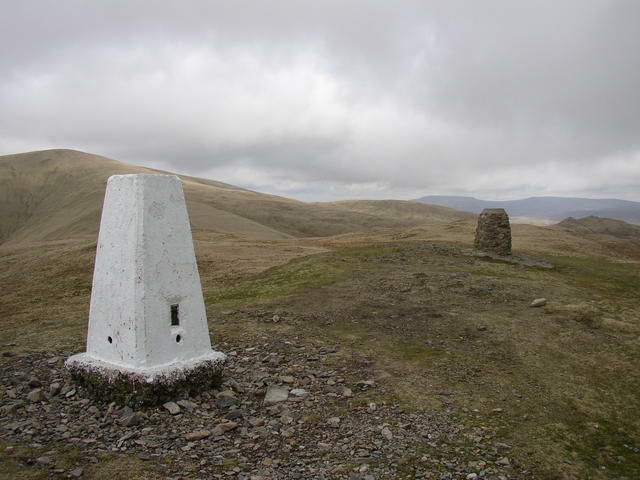 With Arant Haw ahead. 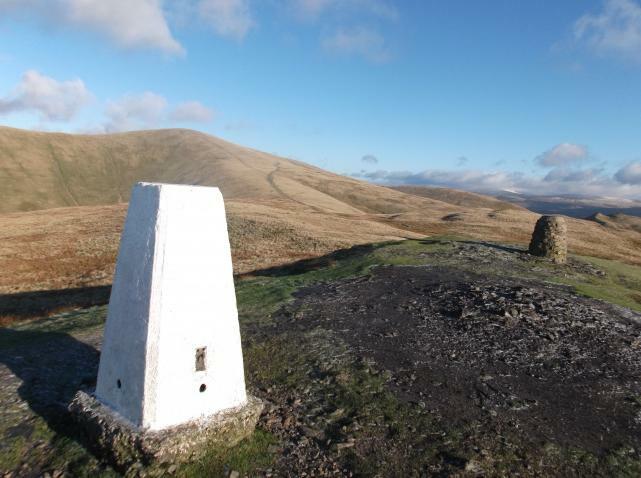 An excellent walk from Sedbergh, then onto Arrant Haw and Crook, on a sunny day with excellent views. 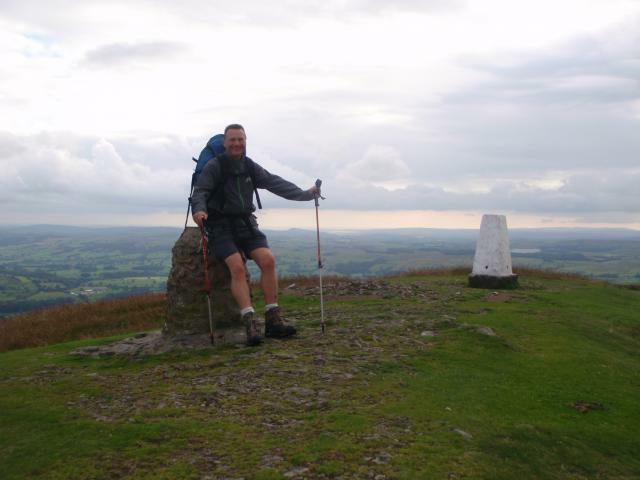 Via Lockbank Farm with Stephen Boff. 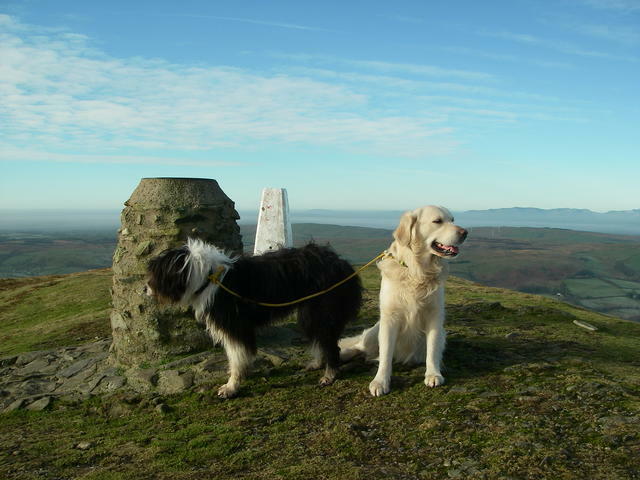 Lovely bright sunny morning and then the mist can in 15 minutes before the summit. 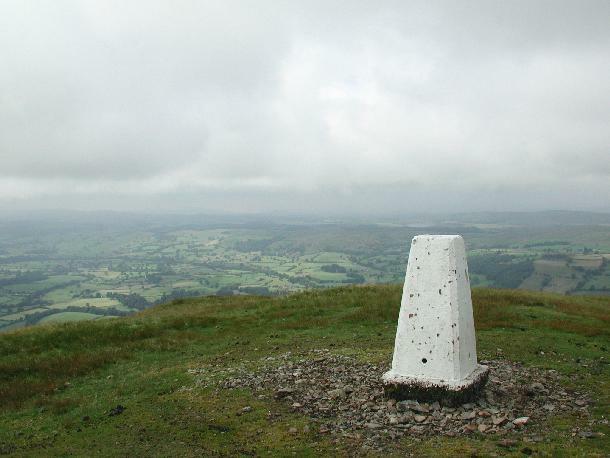 Then back to back Winder a P30 + trig. Plenty of people on the hill this Friday. Again, being hazy the views weren't as good as they could have been. 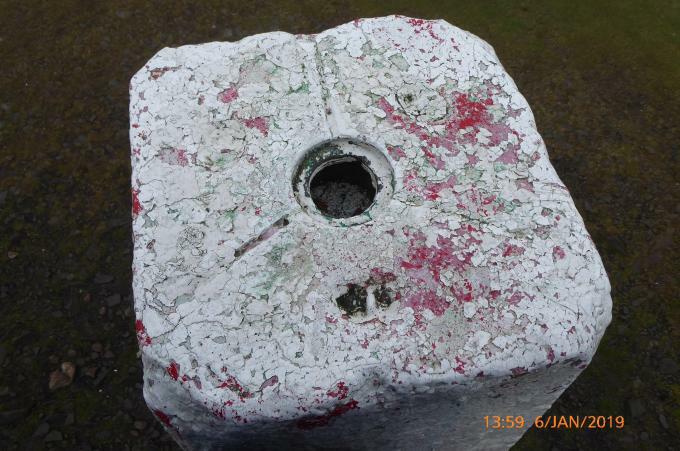 Trig in good condition, but plug is missing. Winder, The Calf & Middleton. 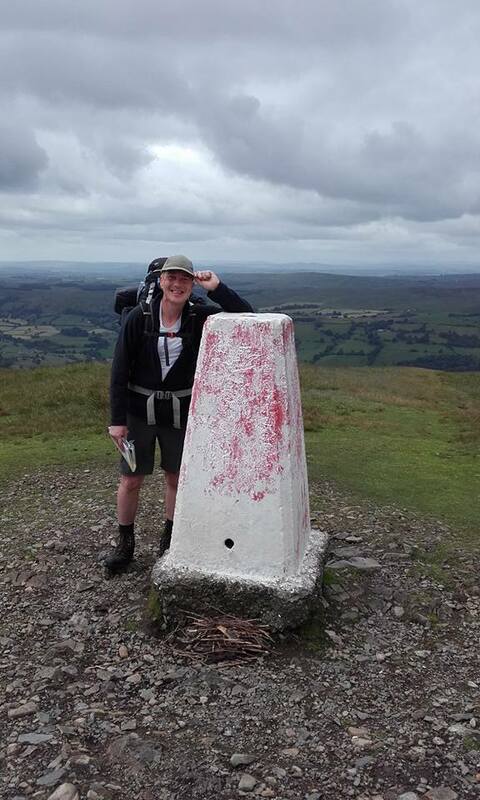 Full marks for fantastic walk. 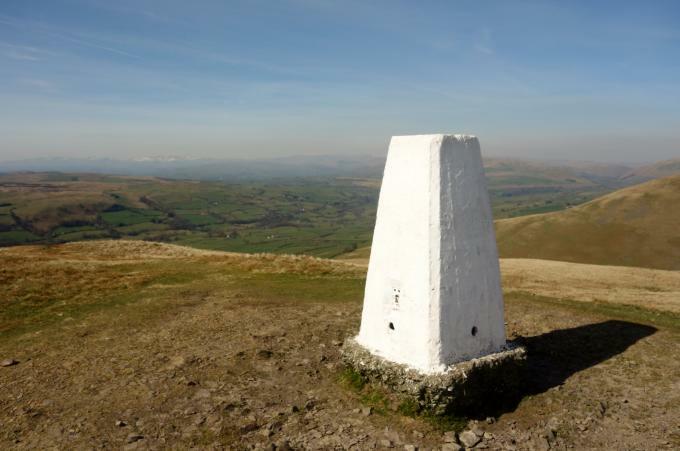 Nice walk up from Sedbergh on a clear sunny day. 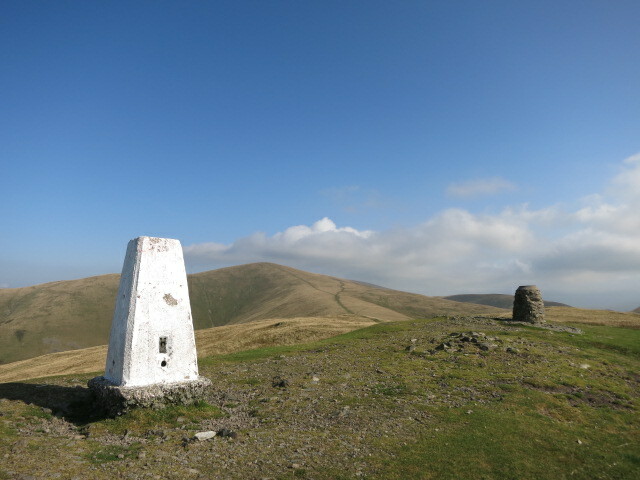 Ascended from Sedburgh on the way to The Calf. Wonderful sunny, but breezy day. Very few people considering it was Good Friday! 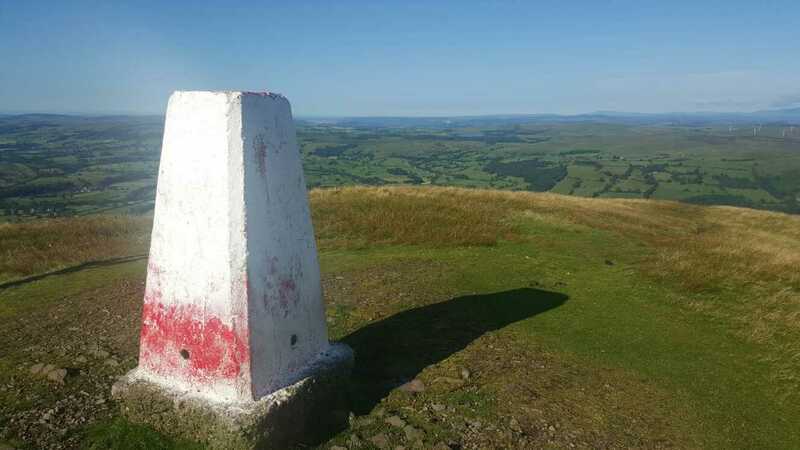 Walked up from heights of winder layby steady steep pull to top, dry springy turf underfoot.Realy fine views from here from dales to lakes and lune valley.Trig in vgc coated in white paint, plug missing there is a toposcope a few metres away,amazing morning light today. 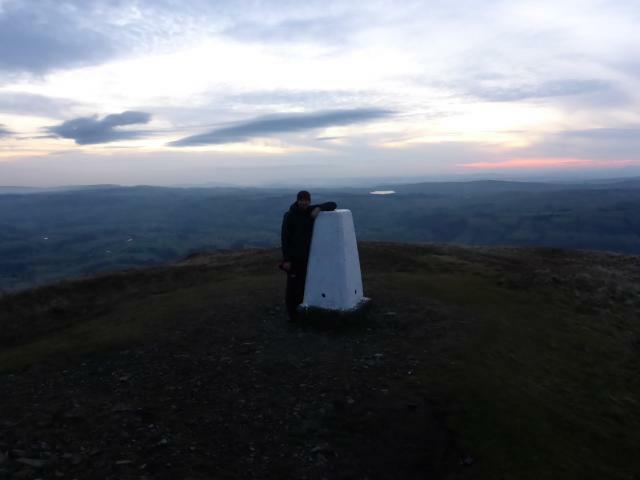 Walked up from Sedbergh. Lovely day, but cold wind. 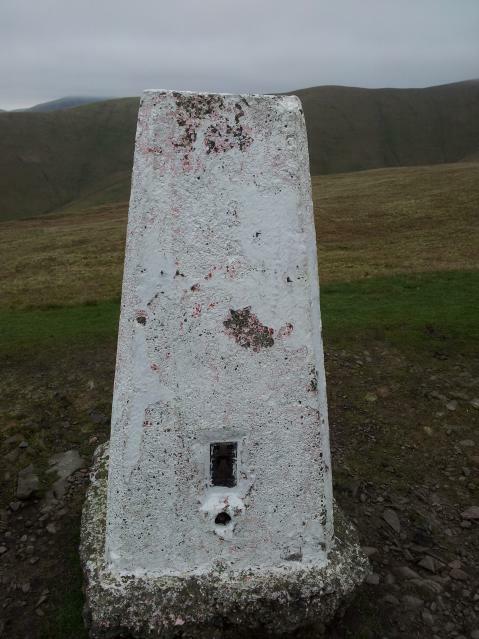 Someone looks after the trigs well in the Howgills! 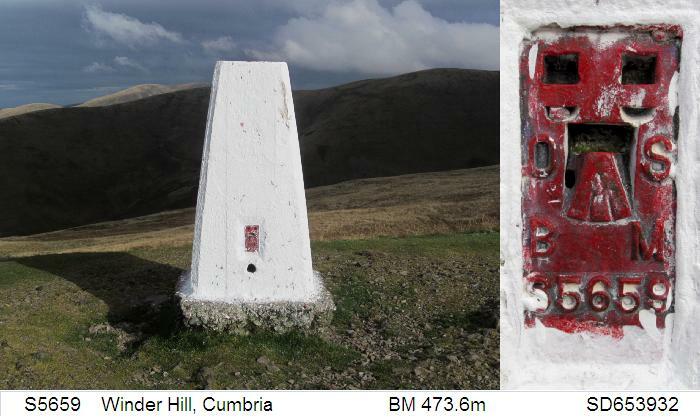 Good coat of white paint, and glorious views of the surrounding fells and the lake district peaks. Steady stream of vistors today. Painted white. No cap. 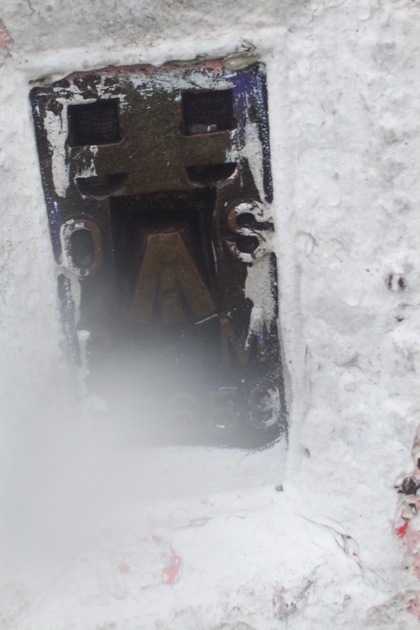 Eroded around the base. 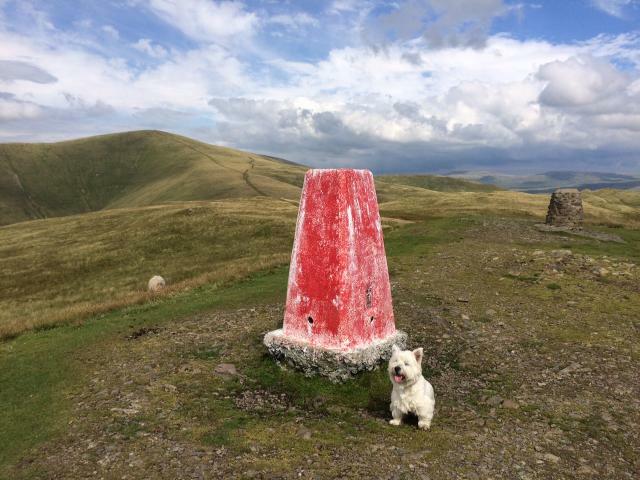 Bagged on a lovely walk via Cautley Spout and The Calf. Weather was amazing for mid March. Fabulous day, bagged with The Calf. Good views, pillar still sound. 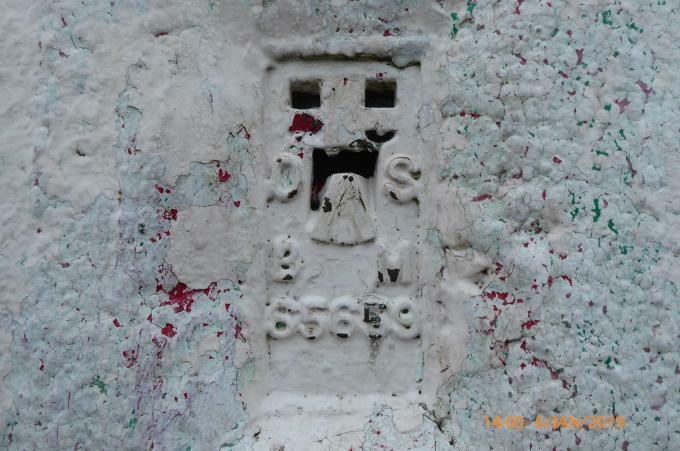 Traces of red paint beneath the white coat it wears at the moment - I bet that was a sight to see. Should probably be called Windier rather than Winder - it was blowing a gale when I arrived in thick fog/mist, before following the ridge round to The Calf. Bagged on our descent from The Calf. 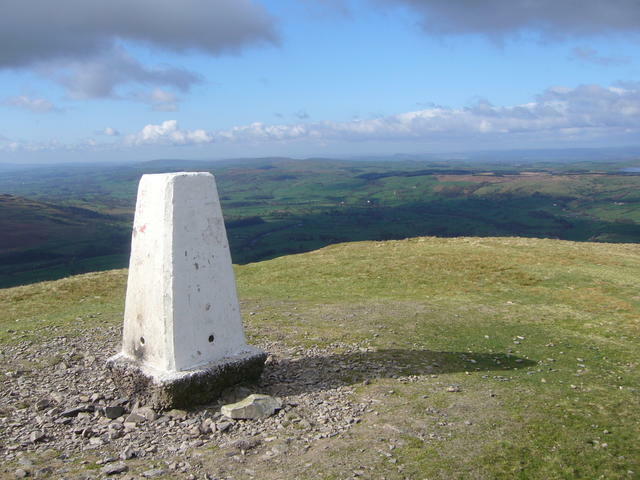 Clear views all round after two hours of torrential rain, gales and mist on Brant Fell. 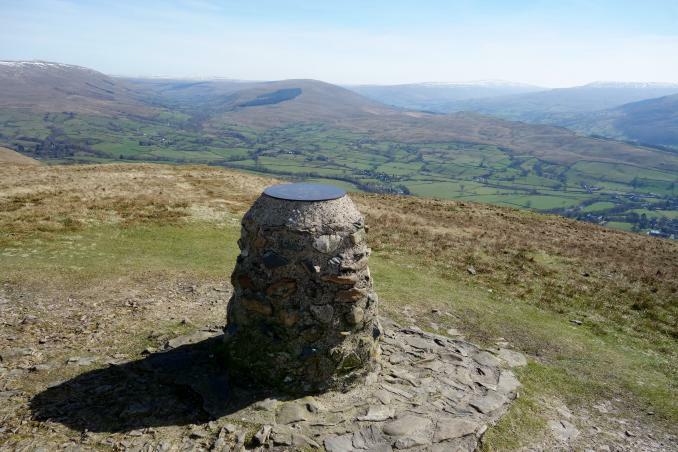 My friend Carole has moved to Sedburgh, and this is her favourite walk. My husband and I accompanied her one day - it was a bit cold, but a lovely spot. 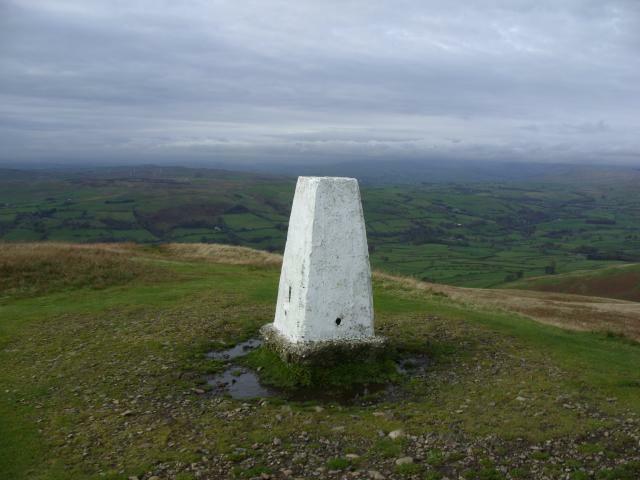 Walked up from Sedbergh choosing rather a steep path visiting this trig on the way to The Calf. Good views all around. 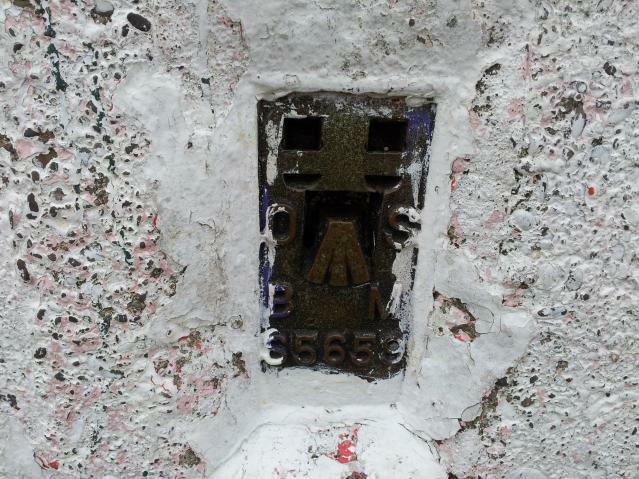 Pillar had obviously at various times worn coats of both red and pink paint wth dark blue metalwork. 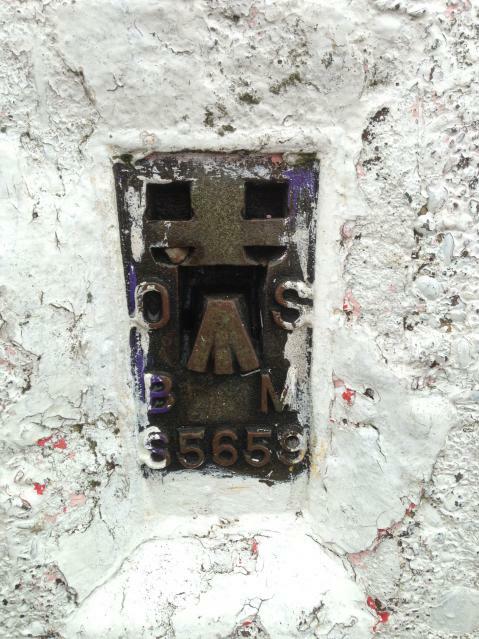 Mssing plug. 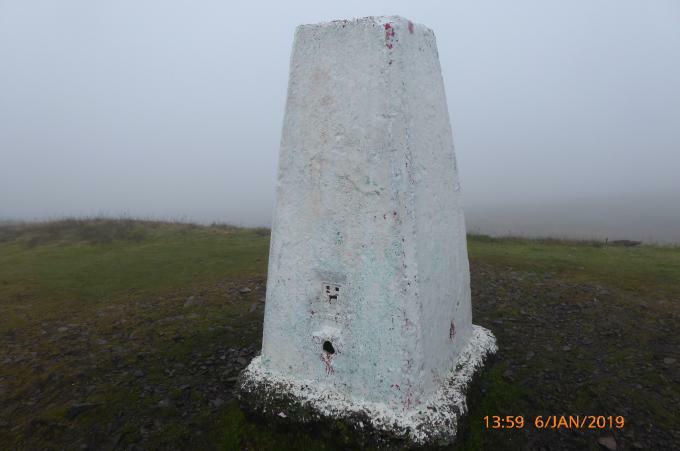 vgc, white, no cap or plug, fine grassy summit, just in cloud so no view today. First of the day: good track from WSW. 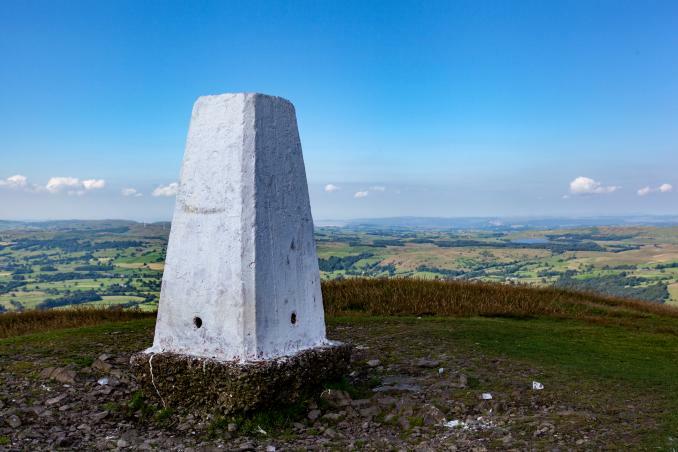 Apparently a topograph adjacent - forgot to examine it. 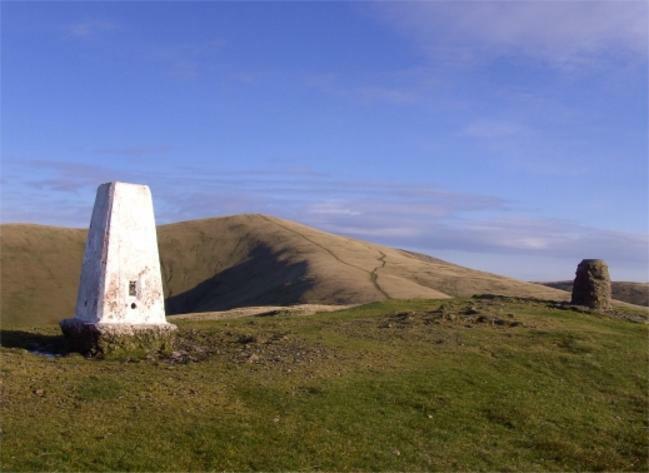 A superb day for walking among the sleeping elephants,myself and 2 dogs Tasha and Spencer were on the Howgills for the purpose of finding the new geocache there (Prankster's Peak) took us 7 hours to complete it calling here at Winder summit and trig twice.Great views today in all directions. 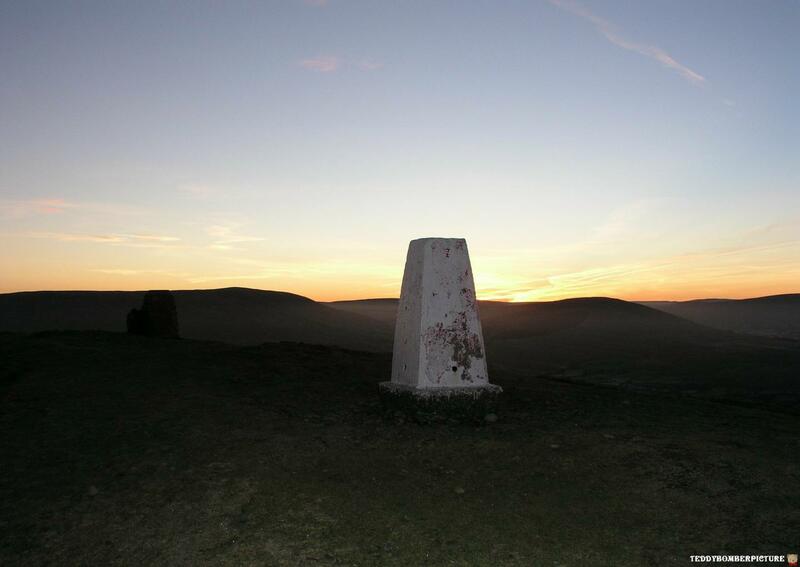 Visited traversing the Howgills south to north-Sedbergh to Gaisgill, parked Howgill Lane bridleway followed track up to Winder Trig in time to see sunrise beautiful on a clear crisp morning, then onwards skirting Arant Haw down to Rowantree Grains up to Calder over Bram Rigg and on to The Calf, the highest of the Howgills at 2218 feet and a good place to rest and take in the all round views,onwards passing White Fell over Bush Howe and down to Windscarth Wyke from which I had intended to climb up to Breaks Head however following a path to the left along the side of the valley brings you to the bottom of Wethercalf Moss thus avoiding an unnecessary climb, from hear up to Simon's Seat from which you can see (with a pair of binoculars) half a dozen Trigs including Middleton,following a quad bike track its a easy walk down to Middleton trig then down towards High Shaw you pass a old pack bridge where Langdale Beck joins Uldale Beck good photo opportunity here, followed the beck down to Low Shaw then over to Cowbound Lane through Longdale and on to Grisgill where a good friend gave me a lift back to Sedbergh (thank you Fiona) the walk took about six hours including stops and camera clicking, A wonderful days walking this route avoids to many ups and downs pick a good day and its great views all the way. 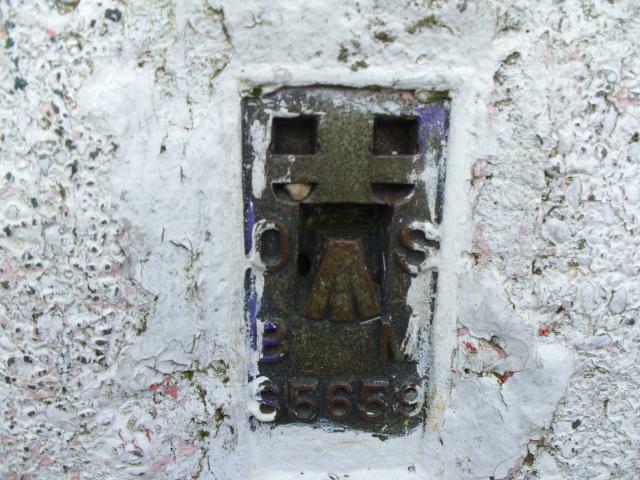 Winder Hill Trig inserts FB & Top Looks like someone thought it was a cake and tried to ice it ! 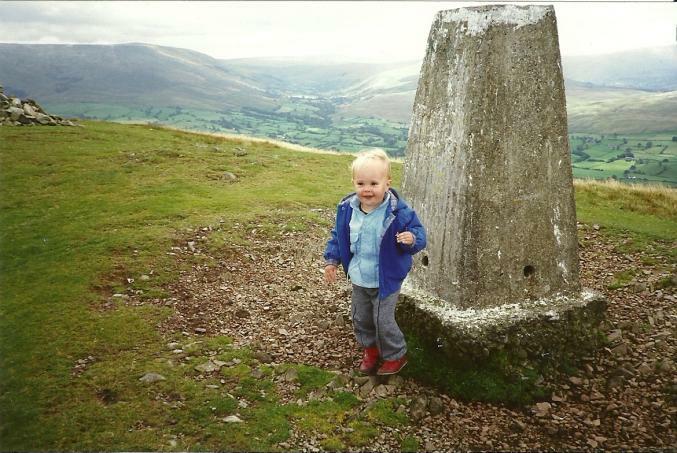 Our second visit to the top of Winder. Today it was on a very wet day with the cloud completely down - couldn't see anything at all! 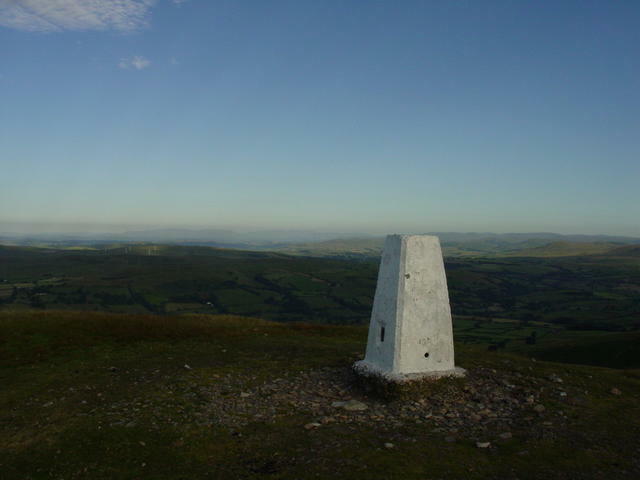 Early morning walk up from Sedbergh before it got too hot. 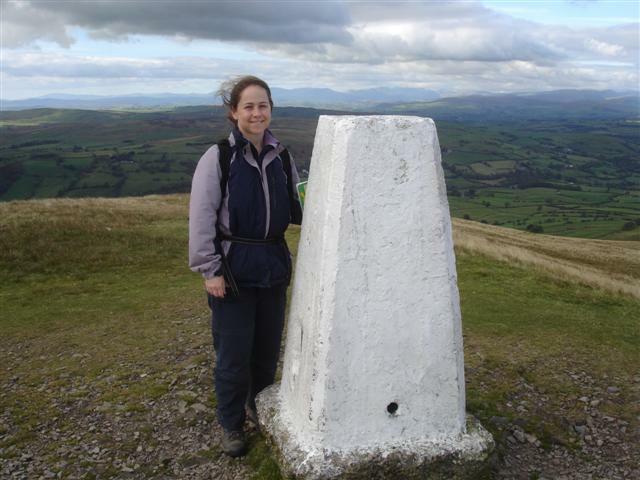 At the very end of a great ridge walk with superb views over Sedbergh and surrounding countryside. Plug missing. FB splashed with paint. 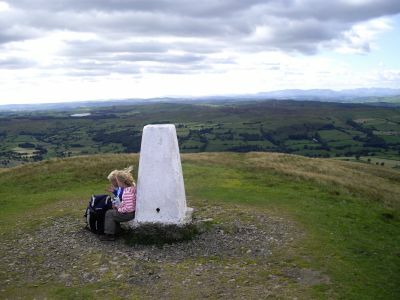 Good views, especially over Sedbergh and across the Lune valley. 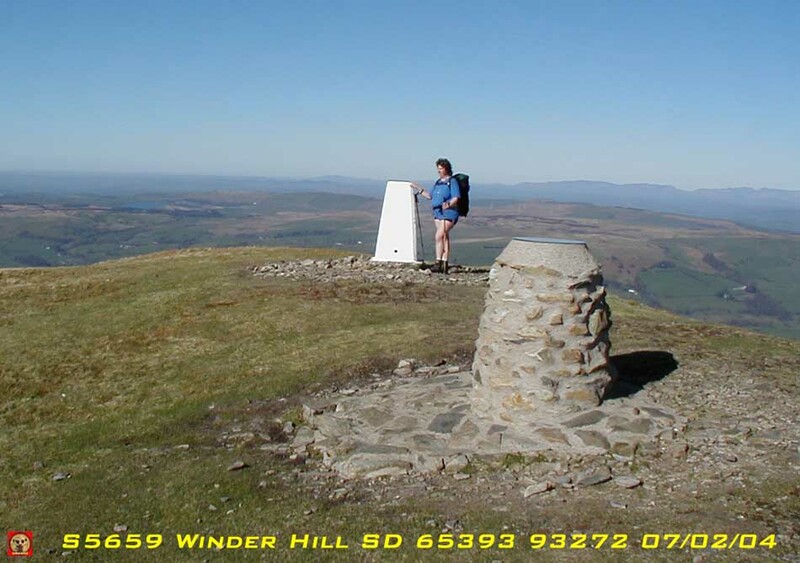 Does anyone but the OS call it 'Winder Hill' rather than just 'Winder'. 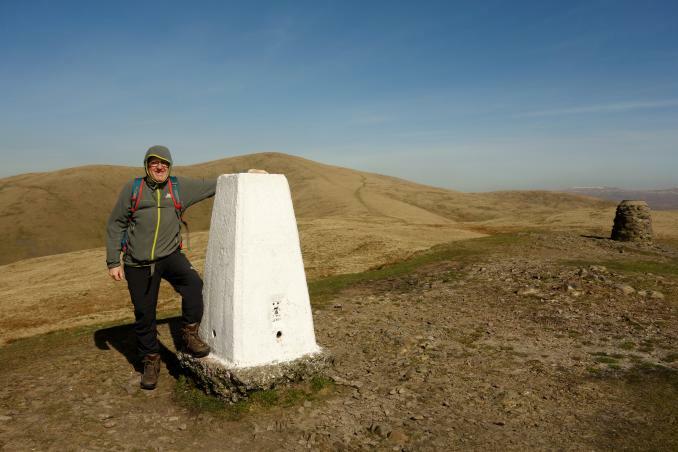 12 mile walk from Sedbergh bagging Winder trig, over Calders and The Calf trig, down very steep by Cautley Spout back along to Sedbergh. 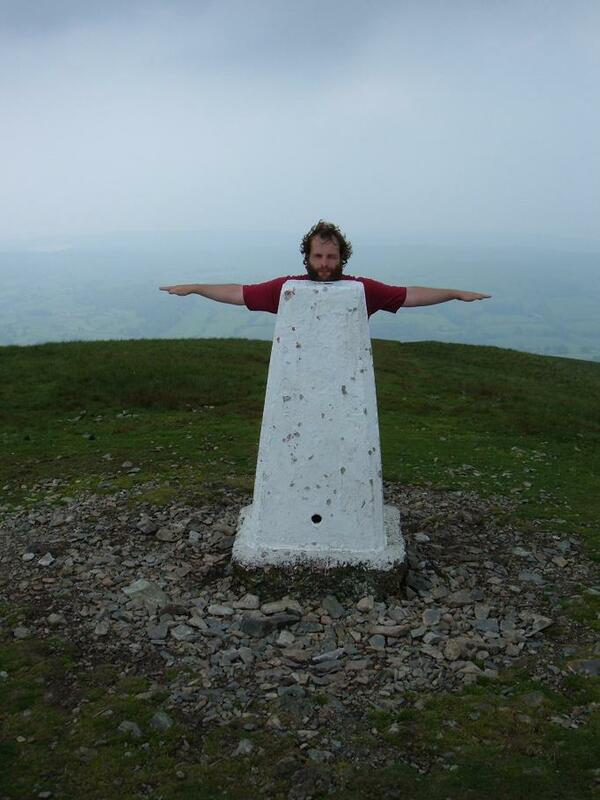 It was horribly hot, and I almost suffered heatstroke due to my unruly mop-like hair, and my impressive beard... As you will see, I 'died' on the trig point... I was then resurrected for the journey onwards to The Calf! 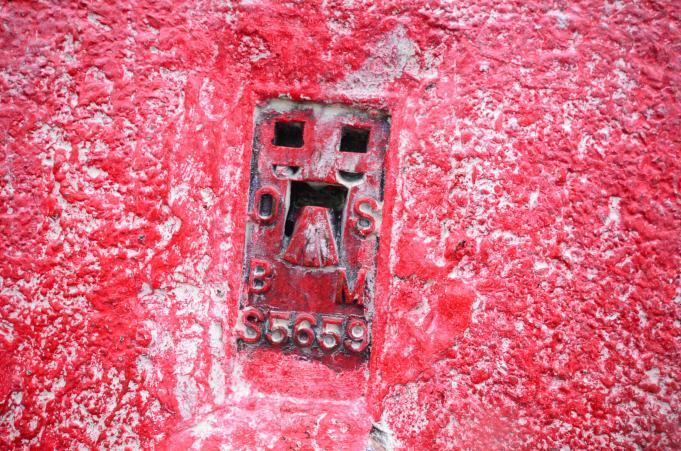 Generally white, but pockmarked with red and pink paint coming through. Done on a horrible wet day. Did Pen-y-ghent the previous day in glorious sunshine and snow on the ground. What a contrast! Repeat visit, a grand day. 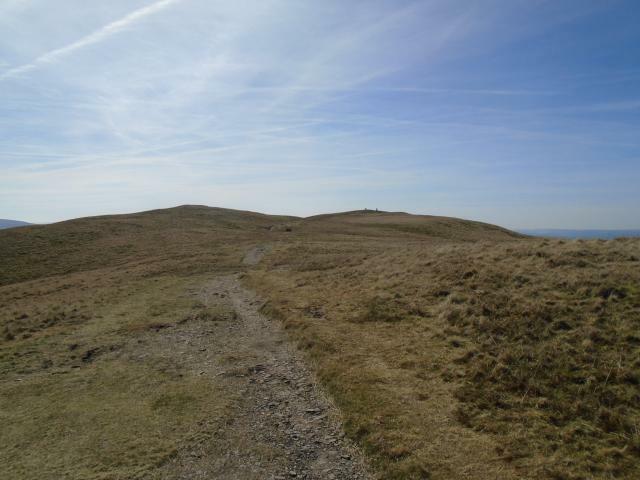 On the way up to the Calf from Sedbergh. "Windier" is right! 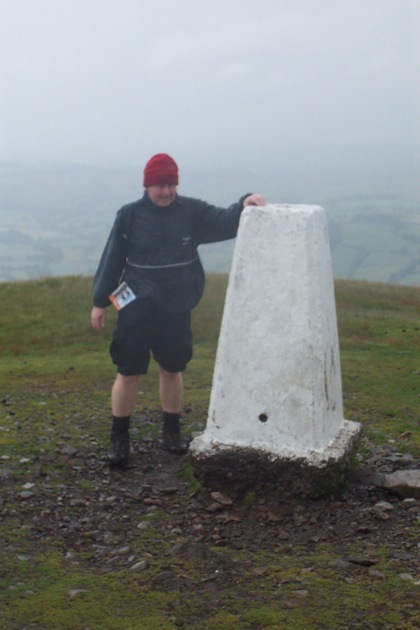 Winded on the way up, plus blowing a gale. Good views! Pillar in good condition.. 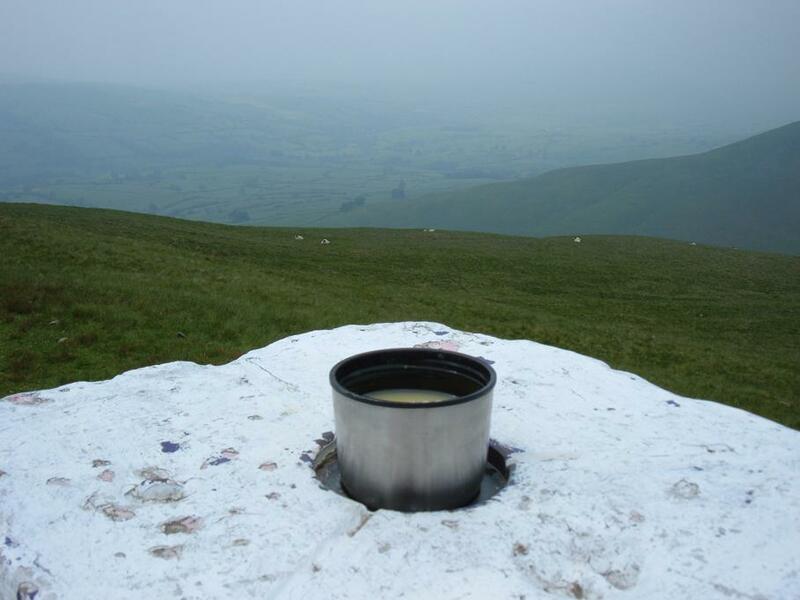 Visited on the descent from The Calf whilst doing 5/7ths of the "Nuttall" Howgills walk (11.1). 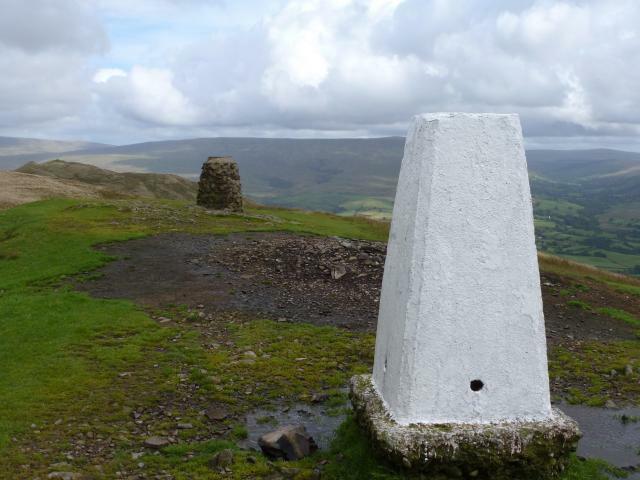 Stopped off in Sedburgh en route from a week in the Lake District back to our work in Leeds. 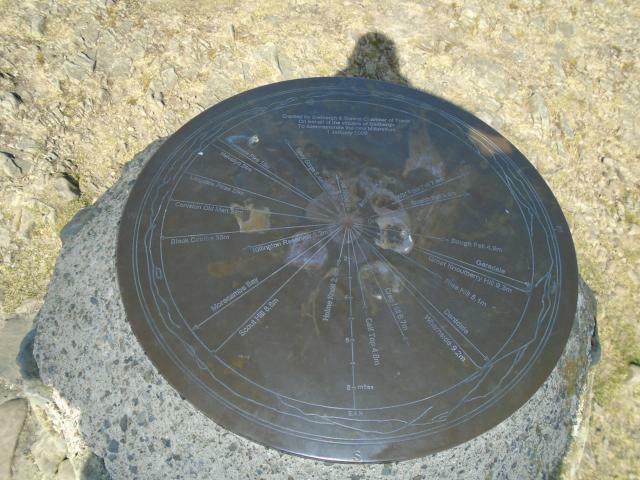 Circular walk anti-clockwise up from the town, very, very windy on top, trig needed an extra I in its name. Wonderful sloes on the way down at Height of Winder. Yorkshire. 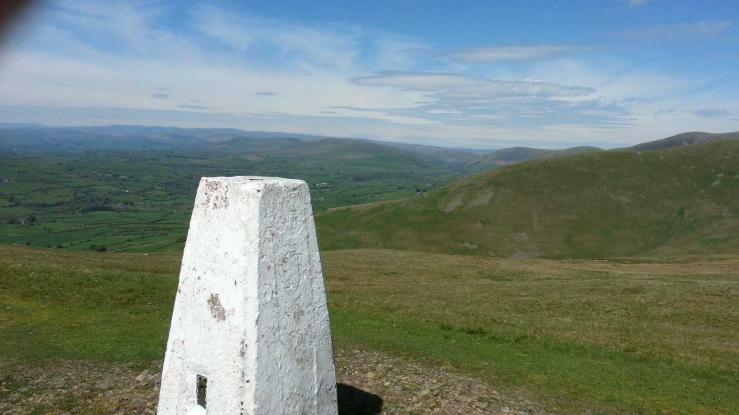 A beautiful summer's day on the superb Howgills. Returning to Sedburgh from the Calf. Getting busier throughout the morning. A perfect outing for a young family. A very warm, humid and unfortunately hazy day. 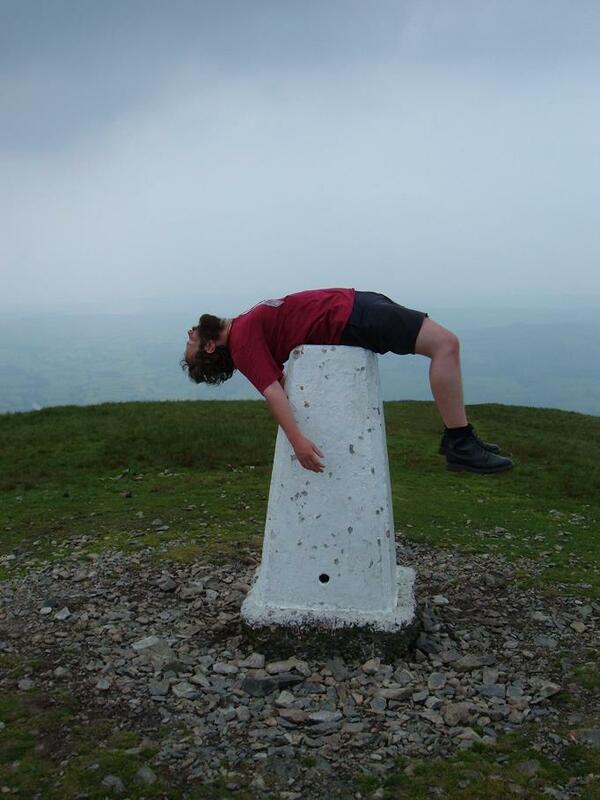 Had a collective sleep by the pillar. First visit. To record FB number. 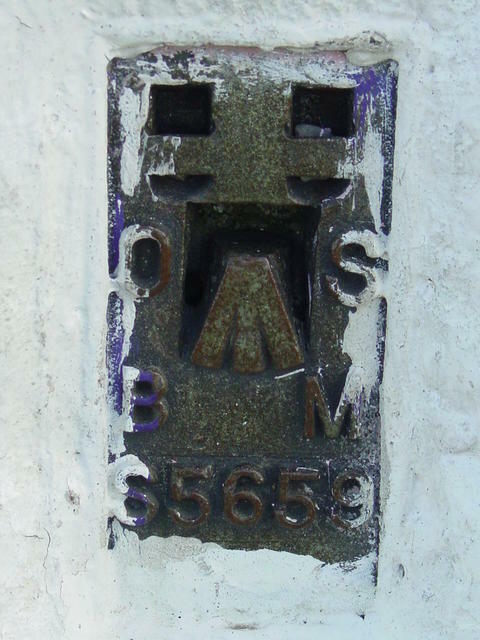 The pillar was completed in September 1949 costing �12.1s.9d. 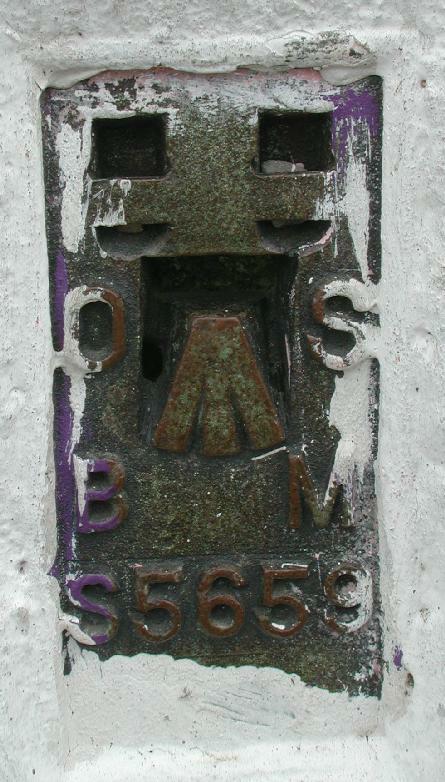 In 1950 this marker was computed for triangulation as tertiary station SD47/T57 in the Barrow-in-Furness secondary block. 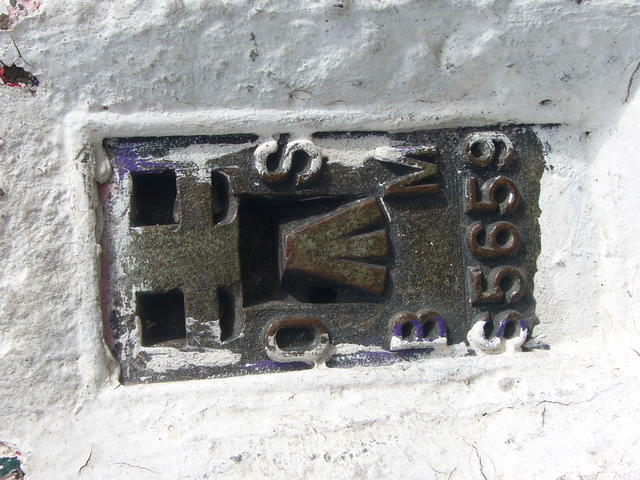 Flush bracket S5659 was levelled for height in 1950. 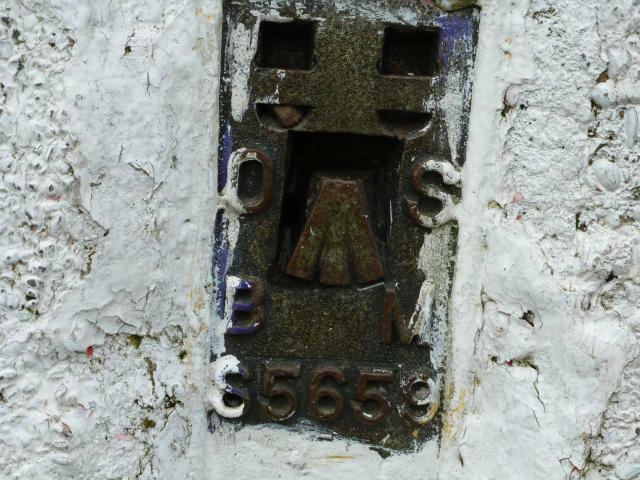 This trig point was last maintained by the OS in June 1976. 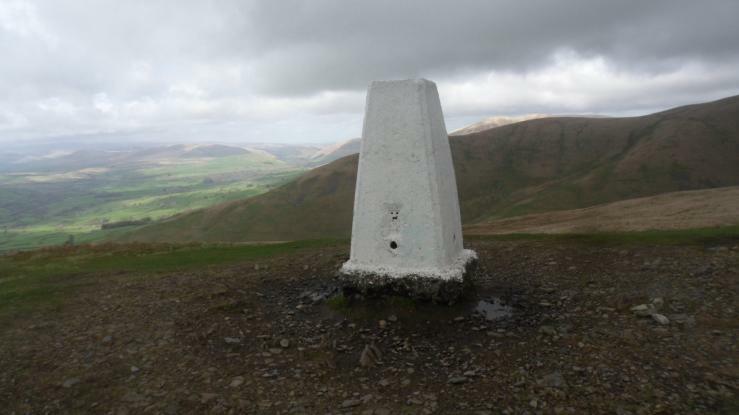 Direct climb from Sedbergh. With Marion and Joseph aged nearly 2. 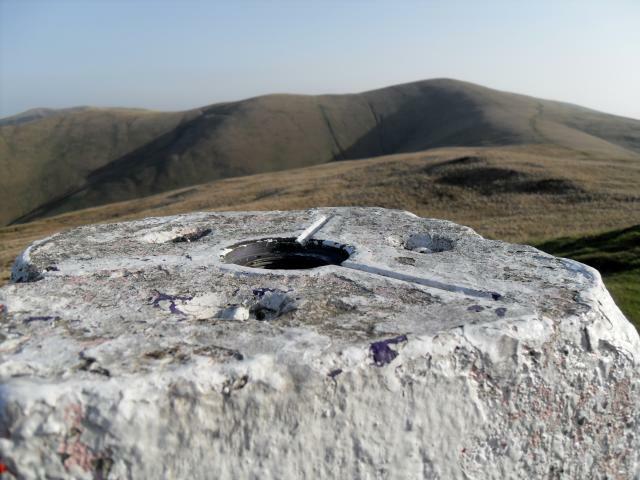 Unpainted pillar on base surrounded by puddle on grassy summit. 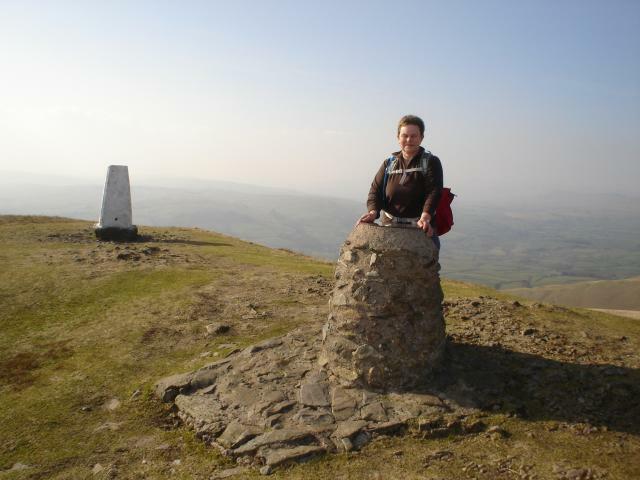 Walking with Marion from Sedbergh. Winder and The Calf. 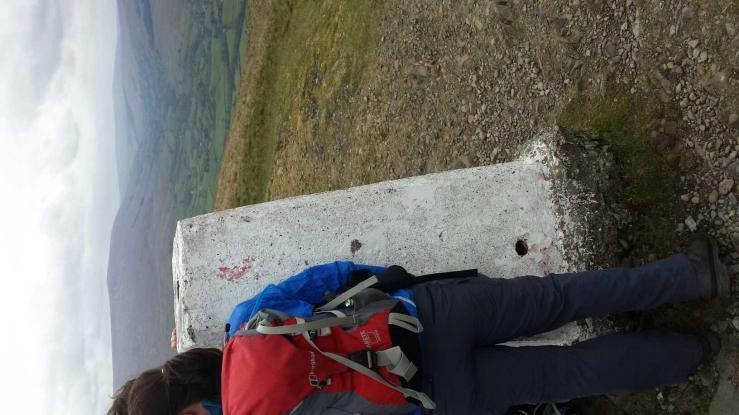 Climbed Winder (cockney for window) on our way to the Calf.